Oh, and on the emotional side, here begins interesting times with Varen. He's off to Aliwal for a spot of diving this weekend. And then I'm off to the course next week with no email, blogging, facebook or Google Talk to keep me company (I hope I survive a whole week of that!). So we are all sitting on the edge of our seats (by "we" I mean: me, Varen and you lot) waiting to see how this ends up affecting our generally fragile status quo. So, before I dash off to do some actual work to minimise the work I'll have to be doing for *another* implementation tomorrow (luckily this should be the last for quite a while!) I thought I'd leave you with some More Internet Madness. 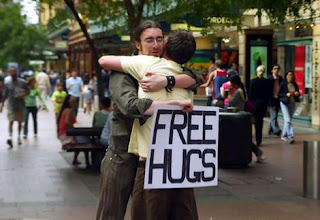 There's this site documenting one man's campaign for free hugs: FreeHugsCampaign.org. The site tells the story of how it all started at an airport in Australia, got banned by the local government and he ended up on Oprah. Strange. Strange but interesting ... in a humanitarian kinda way. I can't say it's something I would get involved in, but I'm all for passing on the message and, to me, it's like an interesting experiment. So there ya have it. Have a fabulous weekend :) And miss me next week! Implementing again ? that sounds like no fun at all. good luck tho i hope you dont get called at 3 am again..